Accountability Counsel supported Russia-based NGO Sakhalin Environment Watch (SEW) in their advocacy on behalf of dacha communities harmed by the Sakhalin II Project. The project is one of the largest integrated oil and gas projects in the world, located on- and off-shore of Sakhalin Island in the Russian Far East. In 2012, Accountability Counsel assisted SEW in filing a complaint to the Organization for Economic Cooperation and Development (OECD) National Contact Points (NCPs) of the United Kingdom and the Netherlands. The complaint focused on the actions of several British banks that financed the project and the large project shareholder, Royal Dutch Shell. The project threatens the health, livelihood and cultural heritage of local dacha owners on Sakhalin Island. Both NCPs rejected the complaint for a variety of technical reasons that have fed into Accountability Counsel’s policy work to improve the NCP system. Learn more about our work advocating for fair, independent, transparent, and effective NCPs. The Sakhalin II Project is one of the largest integrated oil and gas projects in the world, located on- and off-shore of Sakhalin Island in the Russian Far East. Community members, organized as the Stroitel Association, live just 1.2 kilometers away from a liquefied natural gas (LNG) plant and LNG and oil export terminals known as the Prigorodnoye Production Complex. They have suffered from exposure to harmful pollutants, threats to community safety and food security, and the loss of local environmental resources. Despite these significant adverse impacts, community members have not been resettled or justly compensated. 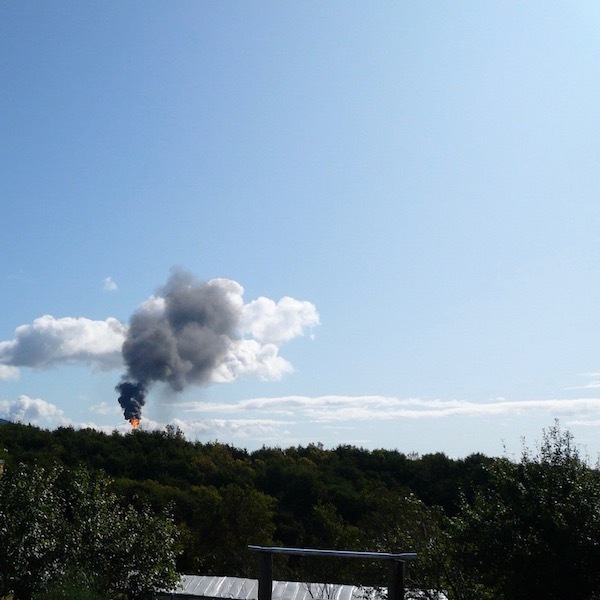 Gas flaring at the LNG plant as seen from a local dacha. In 2003, construction of the Prigorodnoye Complex began, causing degradation of air quality, noise disturbances, damage to and loss of access to local fishing and recreational resources, declines in agricultural productivity, and decreases in community and road safety. Operations began in 2007, leading to further declines in agricultural productivity and degradation of air and soil quality as a result of harmful pollutants emitted at the Complex. The risk of possible emergencies at the operating LNG plant also created additional threats to community safety. Construction and operation of the Prigorodnoye Complex has decreased the value of the land and structures owned by Stroitel Association members, as well as threatened these individuals’ health, livelihood and cultural heritage. This harm has, in effect, led to the displacement of members of the Stroitel Association dacha community, and dacha owners have not been resettled or justly compensated for this displacement. In 2012, Accountability Counsel assisted Sakhalin Environment Watch (SEW) and Stroitel Association in filing a complaint to the Organization for Economic Cooperation and Development (OECD) National Contact Points (NCPs) of the United Kingdom and the Netherlands regarding the actions of three British banks that financed the project and a large project shareholder, Royal Dutch Shell. The complaint to the NCPs detailed threats to community members’ health, livelihood, environment, and cultural heritage, amounting to their effective displacement, on 31 July, 2012. The complaint requested the assistance of the NCPs in facilitating a resolution to outstanding issues relating to community members’ lack of resettlement or just compensation. Accountability Counsel issued a joint press release with SEW and our partner Pacific Environment about the complaint. The complaint was one of the first attempts to hold banks responsible to their duties under the OECD’s Guidelines for Multinational Enterprises. The novel legal theory of the case was rejected for technical reasons by the NCPs, but informed advocacy to improve the NCP system as a whole. Learn more about the NCP complaint process and our impact. Pacific Environment: a nonprofit that works to protect the environment of the Pacific Rim using the local communities and grassroots movements to promote long-term environmental progress. Sakhalin Environment Watch: an NGO that works to protect the wildlife and environment in the Sakhalin area. SEW is chaired by Dmitry Lisitsyn, who won the prestigious Goldman Environmental Prize in 2011 in part for his work with local Sakhalin communities to address the harmful impacts of Sakhalin II. Stroitel Association, a non-commercial gardening association that includes the owners of dachas located adjacent to the Sakhalin II Project’s Prigorodnoye Production Complex in the village of Prigorodnoe, on Sakhalin Island, Russia. The Association was founded in 1979 to support of its 79 members. Accountability Counsel alerted the OECD Secretariat to serious concerns regarding the Netherlands NCP’s handling of the complaint against Royal Dutch Shell in an annex to OECD Watch’s submission to the 2013 annual meeting of NCPs. The Netherlands NCP released an initial assessment rejecting the complaint against Royal Dutch Shell. The United Kingdom NCP released an initial assessment rejecting the complaint against Standard Chartered, PLC. The U.K. and Netherlands NCPs treated the complaint as four separate complaints: the U.K. NCP handled the complaints against the three British banks, and the Netherlands NCP handled the complaint against Royal Dutch Shell. The United Kingdom NCP released an initial assessment rejecting the complaint against Royal Bank of Scotland Group, PLC. The United Kingdom NCP released an initial assessment rejecting the complaint against Barclays, PLC. Accountability Counsel assisted Sakhalin Environment Watch and the community-based organization Stroitel Association in filing a complaint to the OECD National Contact Point of the United Kingdom and the Netherlands. The complaint documented violations of the OECD Guidelines for Multinational Enterprises by Royal Dutch Shell, PLC, the Royal Bank of Scotland Group, PLC, Standard Chartered, PLC, and Barclays, PLC, as a result of their business relationship with Sakhalin Energy Investment Company Ltd., the operator of the Sakhalin II Project, including the Prigorodnoye Production Complex, on Sakhalin Island, Russia. Accountability Counsel issued a joint press release with Sakhalin Environment Watch and our partner Pacific Environment about the complaint. 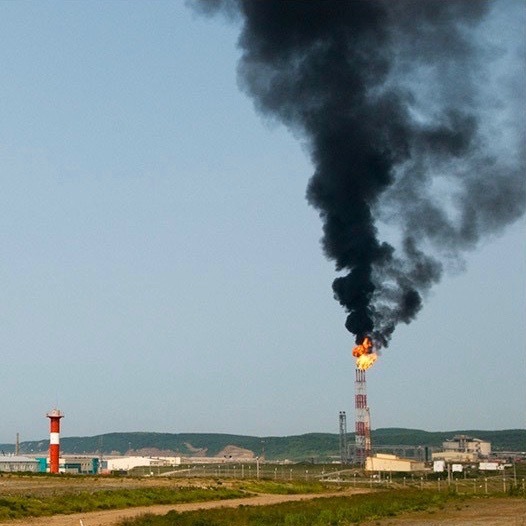 Accountability Counsel supported Sakhalin Environment Watch to document the harm experienced by members of the Stroitel Association and analyze the violations of the OECD Guidelines by the banks financing the liquified natural gas plant and export terminals in their village. Our impact is a public, transparent record of the role these four banks played in causing this harm: Royal Dutch Shell, PLC, the Royal Bank of Scotland Group, PLC, Standard Chartered, PLC, and Barclays, PLC. Through the U.K. NCP complaint process, Accountability Counsel gained first-hand experience with the difficulties of using the NCP system to hold private banks accountable for the harm caused by projects they support. We have fed these lessons into policy work aimed at clarifying the responsibilities of financial institutions under the OECD Guidelines for Multinational Enterprises. The Netherlands NCP complaint process raised serious concerns regarding the NCP’s handling of complaints and interpretation of the guidelines. We raised these issues with the OECD Secretariat in an annex to OECD Watch’s June 2013 submission to the annual meeting of NCPs and have continued to raise these issues in our NCP policy work.